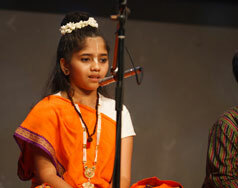 Carnatic vocal music is one of the two styles of Indian classical music. The main objective for running this class is to impart teachings in traditional south Indian classical music to the young generation. At GICC, a comprehensive eight-year syllabus has been framed to cover all aspects of Carnatic music, thereby enabling the students to have an in-depth knowledge of the art and hone their skills. Hindustani vocal music is a form of Indian classical music. The main purpose of offering Hindustani vocal music is to encourage the students to become successful music guides and teachers. GICC offers a structured and comprehensive eight-year syllabus for students to receive an in-depth knowledge of this classical music form. Keyboard is a western instrument like violin, saxophone, guitar, clarinet and mandolin. 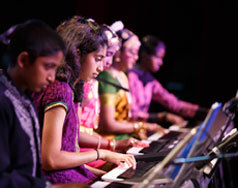 At GICC, the Indian keyboard system is taught that makes students learn and play Indian classical music in an easy way. Students can learn a variety of patterns of Indian Thalas with the help of Metronome. 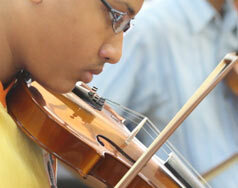 This system will enable the students to appreciate pure Indian classical music. 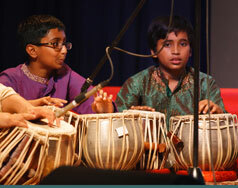 GICC provides an opportunity to learn and appreciate the classical musical instrument, Tabla. An eight-year syllabus has been planned in keeping with the traditional way of teaching Tabla. Along with skill and talent, it emphasises on the importance of patience, perseverance, dedication and determination in pursuing the art. Violin is a very important part of south Indian classical music (Carnatic Music). GICC has framed a comprehensive eight-year syllabus covering all aspects of Carnatic music to be mastered on the violin, thereby enabling the students to have an in-depth knowledge of the art. 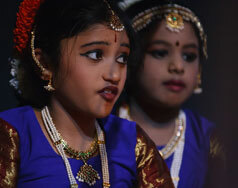 GICC offers an opportunity for students to undertake Bharatanatyam and develop a keen interest in and love for the art. The course has been planned keeping in mind the traditional way of teaching Bharatanatyam. Along with skill and talent, it lays emphasis on the importance of patience and perseverance, dedication and determination in pursuing any art form. Odissi is the classical dance form that originated in the temples of the eastern Indian state of Orissa. Odissi has a systematic repertoire and prescribed sequence of performing the dance. It has a good balance between Nritta, the pure dance and Nritya, the expressional dance. 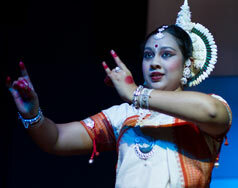 One can experience the richness of Indian culture and heritage through the Odissi dance. This course has been designed for people of different age groups and levels of experience. Kathak is a classical dance form originating from North India. Perhaps the only dance style which has lots of pirouettes, Kathak encapsulates a synthesis of Hindu and Muslim influences, with a combination of both, the devotional and the ‘sringar’, and the incorporation of ‘nritya’ and ‘bhava’. 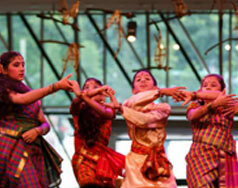 GICC offers a course in Kathak with emphasis on mastery of rhythmic movement. The method of teaching follows the Lucknow Gharana style. Global Rhythms is a contemporary dance form which covers training in non-classical dance forms. This course aims to inculcate interest in modern dance forms along with developing grace and flexibility. 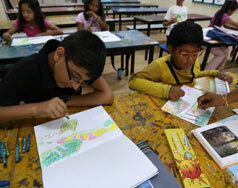 The Art Class is based on contemporary thought and approaches to art education. The training subscribes to the belief among educators that the goal of art education in the 21st century is to help students achieve a better understanding of themselves, and their world, through exploration with visual materials. GICC is committed to the communities it serves through long-term provision of high quality educational programmes, effective teaching methodologies, and continued enhancement of facilities and infrastructure. One such commitment to serve the neighbourhood community was undertaken by GICC in August 2005, when the centre at GICC Queenstown introduced the Yoga programme. 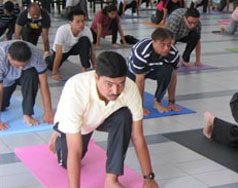 The Yoga programme by GICC, now held once a week at all GICC campuses across Singapore is run by a group of volunteers inspired by Hathayogi Nikam Guruji. The Yoga classes have inspired hundreds of volunteers and has provided cure for diseases, such as asthma, heart disorders, diabetes, spine disorders, skin disorders and cancers. Balvihar is a place for teaching children about the Hindu culture, society and religion in a fun and warm environment. Main objective of this course is to inculcate good values in young children and make them understand the importance of Hindu culture and traditions. Balvihar curriculum is based on guidance, and utilises the outline and course material provided by the Chinmaya Mission, as well as other sources. The language programmes offered at GICC have a structured curriculum with regular assessments. This training not only develops writing skills but also the conversational skills of students. Offered by: Hindi language is offered by both, GICC Queenstown and GICC East Coast. 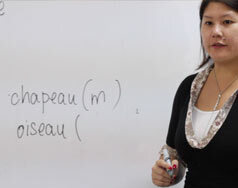 French and Tamil languages are offered by GICC Queenstown. SIP Abacus is a unique combination of eastern method of Abacus and the western science of Brain Gym exercises. A comprehensive cricket training programme by GICC ensures that students receive high quality training and opportunity to play in matches. 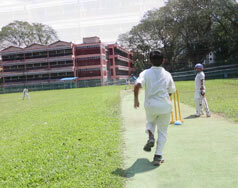 The coach prepares cricketers to participate and excel in international school tournaments, as well as nurture them to play at national and state levels in Singapore and India. The main purpose of offering tennis at GICC is to encourage students to acquire key skills and become successful players in the game. A comprehensive programme for students ensures that the students receive an in-depth knowledge and experience in the game. 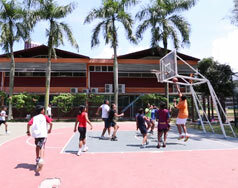 Basketball training at GICC aims to sharpen the skills of students individually and as a team. 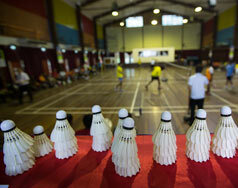 It also helps develop their personality through the game and prepare students to play in inter-school tournaments. Badminton is a competitive game and the main purpose of offering the sport is to encourage students to develop their interest in the game, hone their skill and become successful players. 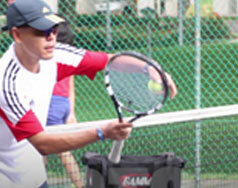 GICC has structured a comprehensive programme for students to gain an in-depth knowledge and experience in the game. 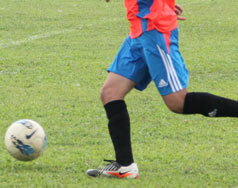 GICC trains students to be successful soccer players and also represent the school in the inter-school matches. The training aims to prepare students and equip them with essential skills in all aspects of soccer.